Powered by EA SPORTS™ IGNITE, NBA LIVE 14 delivers the ultimate on court control combining the art of basketball with the science of next generation technology. Powered by EA SPORTS™ IGNITE, NBA LIVE 14 delivers the ultimate on court control combining the art of basketball with the science of next generation technology. bounceTek, fueled by next-gen visual fidelity and up to 8x the processing power, unlocks a revolutionary new, physics-based dribbling system. Players perform more like their real-life counterparts than ever before, informed by 70+ stats and tendencies, updated not monthly, weekly or daily, but within 1-hr of every NBA game. With fresh content and challenges on a daily basis, NBA LIVE 14 delivers the pulse of the NBA...24/7/365. NEXT DEFINITION VISUALS – Combined with 4x the texture resolution, high-fidelity animations and next-generation lighting NBA LIVE 14 will showcase every detail of all your favorite NBA players, uniforms and arenas to reveal stunning detail. Every wrinkle, every facial expression, and every drop of sweat will make you feel like you’re courtside. REVOLUTIONIZING THE DRIBBLE WITH BOUNCETEK –The dribble is fundamental to basketball, but it’s also the unique signature of every NBA star. Whether it’s Rubio’s wrap around or Irving’s devastating hesitation dribble, creativity is at the core of every move. bounceTek unlocks the full potential of the dribble by releasing the ball to physics, allowing for truly organic control and authentic responsiveness. With NBA LIVE 14, one-on-one matchups take on a whole new meaning and finally allow for creativity and self-expression. NBA LIVE 14 puts the control back in your hands. 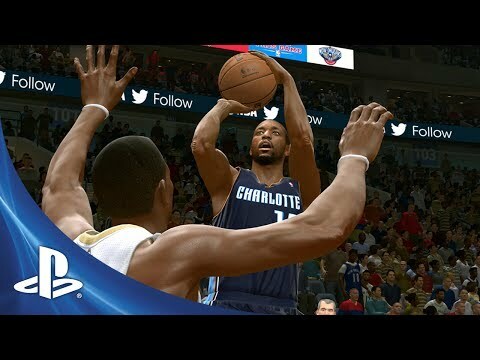 COURTQ DELIVERS REAL TIME NBA — CourtQ (Court Quotient) is the brain of NBA LIVE 14. Over 70 unique stats and tendencies power every single player on the court utilizing the same data all 30 NBA teams use. NBA players evolve throughout the season, and so does CourtQ downloading updates from every NBA game within 1-hr of the final buzzer. If Victor Oladipo gets hot in the NBA, he’ll be hot in NBA LIVE 14.